Owen Charles, 5, was seen at a school program at the Mattahunt Elementary School. Students, teachers, and elected officials gathered Wednesday morning to celebrate the restoration of the name of the Mattahunt Elementary School. 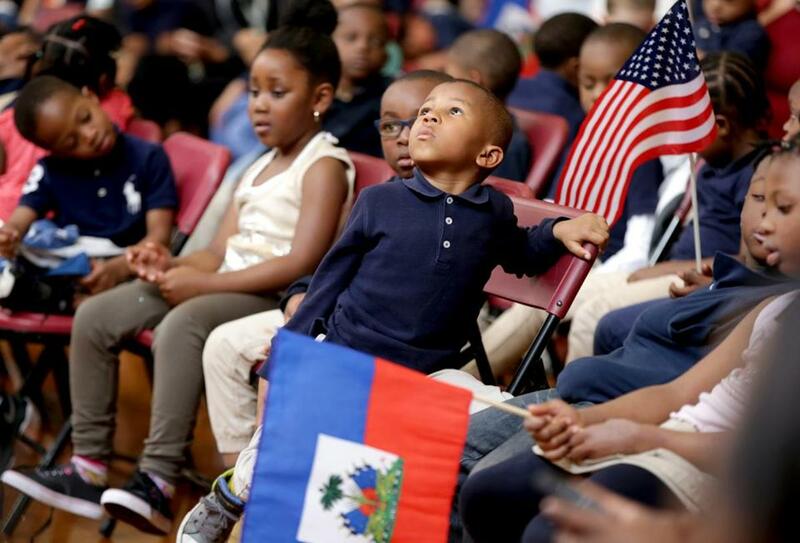 “We’re so excited to see the energy in this school,” said Mayor Martin J. Walsh, addressing the crowd of officials, faculty, and youngsters, some of whom were waving Haitian flags. The ceremony marked a rebirth of sorts for the Mattahunt, which was closed last June and then reopened under a new temporary name, the Mattapan Early Elementary School, which now serves 320 students in pre-kindergarten through first grade. After listening to the community, Boston Public School officials opted to restore the Mattahunt name. Last month, the School Committee unanimously approved Superintendent Tommy Chang’s recommendation. The celebration on Wednesday also highlighted Toussaint L’Ouverture Academy, a dual-language program within the school in which classes are held in Haitian Creole and English. Currently, 22 pre-K students are participating in that program. The program is named after the man who fought to end slavery in Haiti and gain the country’s independence from colonial rule. Henderson, who has been at the helm of the school for two years, was happy with how everything turned out at Wednesday’s festivities, which featured Haitian folk music, African dancing, and remarks from local officials and the Haitian consulate.